One of the troublesome problems of translation is the disparity among languages. The bigger the gap between the source language and the translation language, the more difficult is the transfer of the message from the former to the latter. Nowhere is this more obvious than in the translation of the Qur’an from the original Arabic into English. The difference between Arabic and English and the variation in cultures make the process of translating a real challenge. Among the problematic factors involved in such a translation is form, meaning, style, proverbs, idioms, etc. I am going to concentrate mainly on the strategies and procedures I used for understanding the Qur’an, translating its meaning and later finding equivalent meaning for its verses within the Old and the New Testaments. Typically, a translation is a simple process of transferring a written text from its source language to an equivalent written text in the target language. However, in order to do this successfully, the translator has to first understand the text in its source language. In our case this task is not easy. 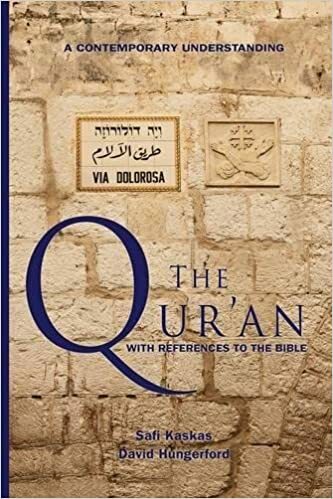 The Qur’an as an Arabic text went through more than two hundred attempts to translate it into English, and none of them claims or was later credited with capturing the meaning sufficiently. Without going into an analysis of the other translations and their positive and/or negative contributions, I would like to move directly to the strategies, methodology and procedures used to produce this translation. Here are some basic assumptions we made in order to develop our methodology. a) The Qur’anic Arabic as a language is the root of today’s Arabic but far more superior to it. To understand a word, we did not only go to dictionaries or to classical commentators, but we went through the process of comparing the word in a verse to the same word in other verses. We found that the Qur’an explains itself. b) Arabic grammar; the set of rules that explain how words are used in Arabic, was created after the revelation of the Qur’an. It had to conform to it and not the other way around. However, while translating the Qur’anic Arabic we had to observe English grammar rules to the best of our ability in order to make the translation as communicative as possible. c) The same goes for the tense of verbs used in the Qur’an. In some verses God uses the present tense and then switches to future or present continuous tense. We understand that using the same tense is proper English, but tense has to do with time, and time is relative to living on the planet Earth which is limited to human beings but not God. However, we tried to use English grammar rules to the best of our ability as stated above. d) The Qur’an is authored by God. The Qur’anic Arabic He used is superior to all others. Hence it does not have synonyms. Every word used has a specific meaning. So while we attempted to render the exact contextual meaning of the original, we also endeavored to be as faithful to the original by using specific terms/words translation such as zalemeen translated to “unjust” or “criminals” and not “evildoers” or “sinners” some times and as “wrongdoers” on others. e) The words and the verses carry important meanings. If we understand the meaning of a verse to be inconsequential, then we should conclude that we have misunderstood the meaning. The Qur’anic Arabic, did not historically or stylistically reflect the language of the 7th century CE. The revealed verses represented a new level of lin¬guistic evolution. They displayed textual qualities that Arabs had not known before. They contained vocabulary of non-Arabic origins that their pre-Islamic poetry had not used. They were composed in a way that is different from the entire Arabic textual body of that period. So while we refer to the Arabs’ understanding of a word at the time of the Qur’an’s revelation, we need to keep in mind that our own contemporary understanding of that word’s meaning is evolving as our understanding of our environment is expanding. For example, when the 7th century Arabs heard for the first time Surat At Tariq (86 The Knocker) the word “knocker” for them used to mean the late night visitor as reflected by the early Qur’anic commentators. But since the verse refers to the knocker as a piercing star, so they concluded the knocker to be the planet Jupiter as it shows up late at night. Today, we understand it to be a pulsating star1. In adding new discoveries to our knowledge, humans take part in con-structing the new meaning of the Qur’anic language in as much as they find in the text the discoveries they have just made. To limit our understanding of the Qur’anic verses to the historical Arabic of the 7th century would mean a regression in our ability to understand our modern world and a return to a pre-modern understanding of the divine text. Before translating the text we found it necessary to read and understand a number of classical commentaries to acquire a better historic understanding of the text and to re-examine differences in interpretations. Many people assume that there is one authentic interpretation of the Qur'an. This is far from true. Even the closest companions of the Prophet differed early on in understanding various verses. In fact no one interpretation can command the following of a majority of Muslims. Islam, in fact, does not have an institution in charge of such interpretation, and there is hardly any major issue on which Muslim scholars do not differ. These differences, more often than not, are due to traditional interpretations of the Qur'anic text based on various stories told by the Prophet’s companions. They, also, may represent a later understanding by scholars when striving to find and represent new understanding. This practice was no longer allowed after the 12 th C.E. Today, traditional scholars still base their understanding of the Qur’an on the same traditional interpretations, except when they are forced to catch up with obvious scientific discoveries. Historically, Arabs were astonished by the text’s aesthetic and rhetorical beauty. We are too. However, we propose that the Qur’an should not be considered simply as a historic, culturally-specific text, but as an entity that exists in and by itself. Its text is fixed and does not change. Yet, we are changing. We gain more understanding of the same text through our gradual growth and our expanding knowledge. Hence, we conclude that the Qur’an has a fixed text and a dynamic meaning. It always allows its intelligent reader to understand it in a contemporary manner, especially if a dialectical relationship is established between the text and its reader. This relationship is usually more obvious when the Qur’an is read by an Arab in Arabic. I kept this principle in mind while translating, but only the reader can judge whether the translation is good enough to produce such results. The Qur’an explains the purpose of our existence on earth and the values needed to make that purpose meaningful. While doing this, it celebrates our unique human consciousness. It urges us repeatedly to think, to reflect, to observe and to learn. Its basic message directs us to consider the existence of a Creator who is the primary cause beyond all existence through His innovative and intelligent creation. The purpose of our short life on earth, it tells us, is to exercise our freedom of choice. Freedom is essential for our existence on earth if we are to be responsible for our choices. The two basic choices we are urged to make are: to recognize God as our Creator, to worship him and to serve others. If we are free to choose and we opt to reject God as our creator and reject the resurrection after death and the eternal life that will follow and egotistically choose to put our own interest ahead of everyone else, we will go away from God. But if we chose to serve Him through serving others, we will draw nearer and nearer to Him. At the end, we are judged based on our choices and His mercy. An eternal life will await the God-conscious people in Heaven. While those who have rejected God and spend their lives serving themselves instead of Him will end in an eternal Hell. The Quran does not contradict itself, and is not dependent on outside sources to explain its meaning. It is, in a sense, self-sufficient. One part of the Qur’an helps to explain another. Hence, when we translate a verse in a certain way, we should make sure that other verses affirm our understanding of that verse. If such evidence is lacking, or if, in fact, our translation is clearly contradicted by other verses, then we should understand that we have a false understanding. Considering its claim for its divine origin, it is impossible to have contradictions amongst the various verses of the Qur’an. The distinguishing feature of a good interpretation is that the Qur’an contains an abundance of evidence to support it. However, the Prophet? expanded and explained further certain verses with general meaning regarding, for instance, acts of worship. The Qur’an teaches that Muhammadﷺ was both a prophet and a messenger of God. So the Qur’an contains both the verses given to the Prophet, addressing the creation around us and the universal laws, as well as the verses of the Message given to him as a messenger addressing how to best worship God and how to live successfully alongside others on this planet. The Messenger Muhammadﷺ explained these verses in detail, especially those related to worshipping God. Hence, the way Muslims perform their ritual prayers, the way they fast and all other acts of worship are practiced according to the example and teachings of the Messenger. They can’t be changed. Other verses the Prophet very wisely did not explain because he did not want us to be committed to a seventh century understanding of the world around us. For this reason, we look today to NASA to better understand the universe around us and not to a historic interpretation given by a companion or an early scholar. The translator believes that the Qur’an is the indirect speech of God, verbally revealed to Prophet Muhammadﷺ through the Archangel Gabriel (Holy Spirit). We regard it as the miracle given to Muhammadﷺ to prove his prophethood. It is also a book of guidance to humanity. As such, we assume it corresponds and parallels the universe which is also the words of God materializing all around us. In order to understand our world, we need to grasp the meaning of both, the words of God as the universe and His revealed words found in the Qur’an. The more we understand one, the better we understand the other. As such, we are called by the Qur’an to reflect on the basic universal laws as we can observe them in the world around us. The Qur’an as a book of revelations should not contradict the reality around us and should not contradict reason. Therefore, we assume that the best way to understand the Qur’an is through sound rational analysis. Hence, a new reading of the Qur’an based on the tools of knowledge available to us today should provide a better and deeper understanding beyond the existing traditional exegetical commentaries. On the surface, this seems to contradict the fact that the Qur’an itself calls on us to believe in its divine origin based on faith and not reason. We are also called to believe in resurrection after death, the Day of Judgment, Heaven and Hell and Eternity. All this is in what the Qur’an calls “Ghaib” translated as: what is beyond our senses and/or human perception. A believer is required to accept these doctrines based on faith, defined as “the substance of things hoped for, the evidence of things not seen” (Hebrew 11:1). The Qur’an does not discriminate or generalize in its condemnation of any people. God describes Himself in the Qur’an as “the Just”. The principle of “no soul will bear the burden of another” (17:15) was mentioned in the Qur’an 5 times. Most classical commentators mentioned specific Jews or specific Christians addressed by a specific verse. We are taught to ask whether the pronoun Al (the) before the name is specific or general. As such, I understand most of what is mentioned in the Qur'an about “the Jews” or “the Christians” to concern only those who were involved with a particular event--not all Jews or all Christians. The original text had no punctuations and was not divided into paragraphs. Early Muslims learned to recite the Qur’an from memory, the way they originally learned it from the Prophet. Punctuation marks were added later, but Muslims knew instinctively where to stop. However, westerners who are newly introduced to the Qur’an find it very hard to make sense of a text that is not organized the way they are used to. Most translators, did a continuous translation of the text of each chapter without paying attention to the difficulties non-Muslims face when they read it. We found it necessary to divide the text of each chapter into paragraphs following the meaning and the subject matter. In addition, the Qur’an is not that easy to understand by the average Arab, let alone the average westerner. While it has an inner logic in the way it tackles various issues, it will help to facilitate showing this inner logic by organizing references to the subject matter to help the reader understand. The translation will be done with the goal of accuracy, naturalness, and clarity. a. The meaning of the original text is to be translated accurately, exactly. b. We will translate the meaning of ideas. This is not word-for-word translation. c. Meaning will have priority over form. d. Naturalness of expression will have priority over form. e. Translated materials should sound natural and be readily understood by the target audience. This includes word order, grammar, sentence length, idiomatic phrases and figurative expressions. f. Vocabulary will be carefully chosen, with common words preferred over outdated and with the goal of producing a translation that is clearly and correctly understood by all English speakers, especially the younger generation. We determined after careful sociolinguistic research, that our primary target audience is an average American with a high school education. The language used should reflect this choice. We used common English, used in everyday life, where the reader will not usually have to use a dictionary to understand the words. Other fringe audiences outside the U.S. are also considered, such as English-speaking people in Southeast Asia. When reviewing the Arabic text of the Qur’an, we tried to define the culture-bound terms and allusions usually taken for granted by Muslims familiar with the Qur’anic terminology and the use of names of people and places and opted to use the Anglicized version, in order to better communicate the meaning. To give the closest approximation of the source language, it was necessary to opt for creating a glossary of words and concepts and to use some explanatory footnotes. Grammatical and syntactic structures do not often correspond between Arabic and English. We, therefore, found it often misleading to maintain the same form as the Qur’anic source text. So, changes of form were often necessary. We, therefore, employed as many or as few terms as are required to communicate the original meaning as accurately as possible. We recognized early on that the transfer into English should be done by mother-tongue speakers. Therefore, we recruited and worked with a team of native- speaking Americans. We also realized the need to test the translation as extensively as possible in the United States and among other English-speaking communities in other parts of the world, in order to ensure that it communicates the meaning clearly and naturally, keeping in mind the sensitivities and experience of our targeted audience. We left the monitoring for qualitative and stylistic errors in the text to the revision stage where we did several re-evaluation attempts. Several qualified volunteers proofread and contrasted the translation with other existing translations of the same text done by other translators. They looked into the differences and identified them. I, as the main translator, had to make sure that what we have is closest to the original meaning. A celestial object, thought to be a rapidly rotating neutron star that emits regular pulses of radio waves and other electromagnetic radiation at rates of up to one thousand pulses per second. He is a co-founder of East West University, Chicago, IL; and was elected as President of its Board of Directors from 1979 – 2005. Under his leadership of the Board, East West University acquired its accreditation from the North Central Association and developed a strong fundraising network that built a solid foundation for its continued growth. He is currently a member of the University’s Board of Directors and a strategy consultant for a number of business organizations in the USA and Saudi Arabia. As the Founder and President of Strategic Edge Management Consultants, Dr. Kaskas helped many mid-level and large corporations successfully develop their business portfolios. His consultant firm focused on strategic development within the health care industry and founded the American Strategic Healthcare Management Company (ASHM) which owns diagnostic centers and plans to acquire healthcare institutions in Jeddah, Saudi Arabic. He organized participated and moderated hundreds of business seminars, workshops and lectures on strategic management and business ethics and a variety of related topics. In addition to his focus on strategic management sciences, Dr. Kaskas has studied Abrahamic religions and lectured throughout the US on subjects related to Islam, the development of American Muslims and the future of Islam in the U.S.. With his study of the early followers of Jesus and the Development of the early church, he became a regularly invited speaker at universities, colleges and churches on reconciliation between Evangelicals and American Muslims. Dr. Kaskas is a board member of Bridges, an organization working on faith-based conflict resolution and is invited to speak on a regular basis at the National Prayer Breakfast in Washington, DC on such topics as reconciliation, the Qur’an, and Jesus’ teachings. He is the translator of The Qur’an a contemporary understanding and the coauthor of the Qur’an with cross-references to the Bible. He also authored The Kindest of Manners, a collection of hadiths from the six authoritative books on Hadith. Dr. Kaskas is a senior researcher in Islam and Multifaith Reconciliation at the Center for World Religions Diplomacy and Conflict Resolution.